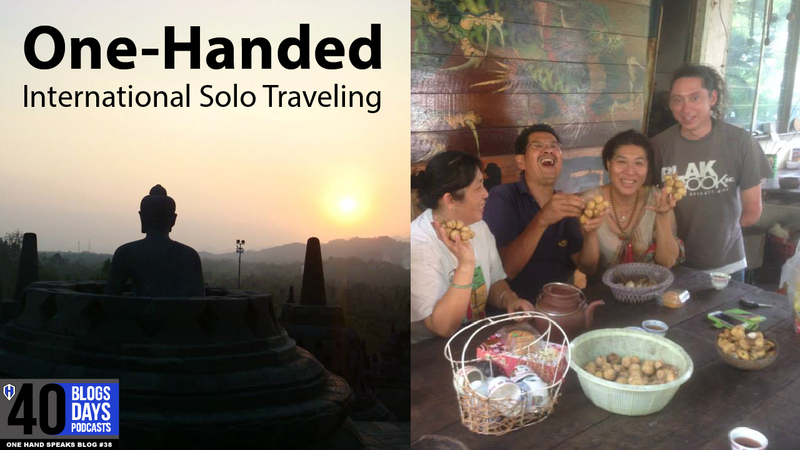 Solo traveling international style with one hand has it’s own flavor. Traveling with a disability has an entirely different set of concerns, considerations, and contemplations. Additionally, each type of disability has it’s own unique qualities and challenges. Blog #39 of “40 Blogs in 40 Days about 40 Podcasts” tells the tales of one-handed traveling. Carrying my bags, safety and security, and managing my gear are just a few of the topics I cover in this uniquely crafted blog and podcast about one-handed traveling. One of the things that makes disabled international travel so interesting is how different cultures perceive me and my body. I get different looks and reactions to my one-handedness based on which country and it’s culture I find myself. Finland was a very different experience than Malaysia in how I was perceived as a person with a disability. In each country I have traveled I pay attention to how the people view and react to me, especially children. My time in the Asian countries were so different than my time traveling and speaking in the area of Europe. When traveling to China and Tibet I booked my flights on Hainan Airlines, A Chinese based company. Even leaving the United States at the terminal port for Hainan Airlines was noticeably different. The Chinese airlines workers went out of their way to ask me if I wanted to board the plane early. The two ladies refused to let me carry my bags to the plane and insisted on stowing them for me. Being one of the first people to board, having all my baggage carried, and being catered to through the entire process I started to feel like a rock star. The way children looked and perceived AlejAndro while he was in Malaysia was much different then he knows in the United States. However, after a while he won them over and enjoyed a great time being together. The issue of safety and security came up a number of times. Things I never thought I had to think about traveling with one hand were revealed to me. One thing I noticed was if I am holding something with my only hand, like my wallet, I need to be aware of what I do with it as I do other activities with my only hand. In Estonia, I was aware of some not-so-cool people watching me do things. I felt like I was being sized up for a mugging. Though there are many things I want to see when I travel to other countries, a police station and a hospital are not on the list. When I was speaking to a class of high school students in the Czech Republic, one of them asked me if I was scared to travel with my disability. He said he was asking the question because they have “mugging gangs” who seek out tourists. He ending by saying, “you look like and easy victim.” When I replied with, “Well, I guess it is a good thing I have a couple black belts in the martial arts,” I received a loud reaction of laughter. I finished by saying, “Regardless of what kind of body you have or the types of issues you have with your body, there are always risks in traveling. But what I really want to share are all the cool things I learned about myself as a one-handed human. Not to mention learning all these great insights into the life of a disabled traveler. If you have one hand your are going to love this podcast. If you have two or more hands I think you will find it both funny and educational. To listen to the first of many adventures traveling with one hand I invite you to click on the link and enjoy my One Hand Speaks Storytelling Podcast Episode OHS004.